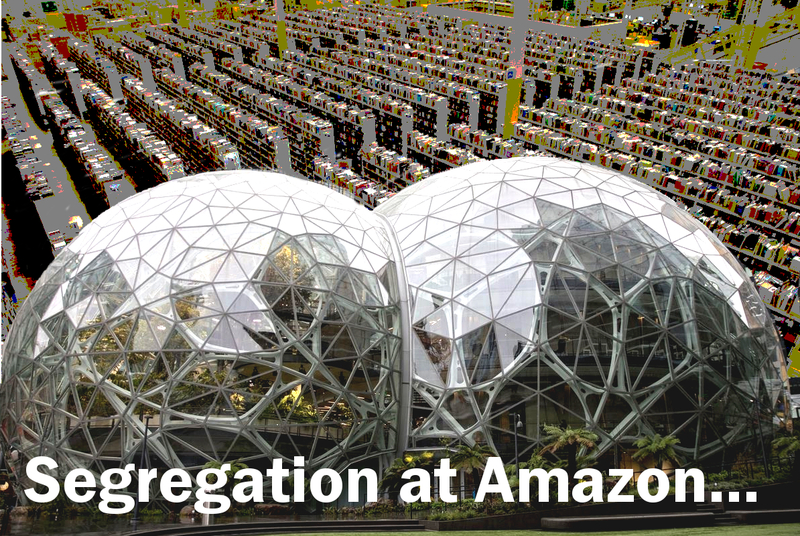 Amazon “fulfillment centers” are bleak compared to the biodomes that adorn their Seattle office. The frenzied bidding for the Amazon headquarters has made a spectacle of economic winners and losers among America’s cities. Led by Rahm and Rauner, Chicago’s business and political establishment are eager to fork over billions in tax credits and other subsidies for the promise of jobs. Amazon’s warehouse and logistics footprint keeps expanding across the exurbs of cities, with the help of billions in tax dollars. Yet, scholars find their promise of job growth empty. Though Amazon’s game pits city against city, recent research shows that inequality has risen more within metropolitan areas than between regions. Much of the increasing inequality is linked to the shift towards tech and the knowledge economy. This trend is already well established in Chicago, where the benefits of high-paying jobs are distributed inequitably, reinforcing the cycle of segregation. The ample resources at downtown’s selective-enrollment Jones College Prep contrast with under-resourced neighborhood school Crispus Attucks (later closed). Signs of these inequities are present all throughout the tech economy. The lack of diversity in tech has drawn scrutiny from the federal Equal Employment Opportunity Commission. Ever-increasing rents have brought gentrification and displacement throughout the Bay Area – threatening social mobility there. Within Amazon inequity thrives. Jobs at their warehouses, or “fulfillment centers,” are non-union, dangerous, low-paying, and require rapid, high-stress work. Innovations by Amazon will allow them to push the pace even further by tracking and surveilling their warehouse workers. Meanwhile, Amazon seeks to ensure downtown amenities and a public transit network for its headquarter workers and managers. For these better-paid employees, Amazon presumably wants access to affordable, safe, middle and upper-class suburbs along with “good” schools. The inequities found in the tech sector translate into deep, generational racial and class inequalities. These inequalities persist through the same institutions of segregation erected and developed through public policy in the 20th century: schooling and housing. The business elite of Chicago want to cement its status as a global city, uniquely situated to host the next wave of tech sector growth. At the same time, the city doubles down on policies that perpetuate segregation. This year CPS proposed to shutter all neighborhood high schools in Englewood. The plan would send current students to other underfunded schools, miles away. The district has backed away from the worst aspects of the Englewood proposal. Yet, it still plans to close National Teachers Academy (NTA) – a successful, predominantly African American elementary school – and convert the building into a high school for the South Loop area. Since the inception of Chicago’s public schools, corporate interests have used their access to city power to influence and hold sway over school policies. With this influence they’ve ensured that schooling matches the expectations and logics of dominant industries and business trends. For example, hedge-fund billionaire Ken Griffin sits on the Amazon recruitment panel along with a long-list of who’s who in Chicago business. Griffin has called for an aggressive wipe-out of Chicago’s public schools. He even said that the 50 CPS school closures in 2013 were nowhere near enough. Griffin has claimed that even 50 school closures were not enough. The Chicago Board of Education’s proposed closure of NTA would deepen class and racial inequities. At the same time, it would signal responsiveness of City Hall and the school district to one of the fastest-growing communities of high income earners in the city. In recent years, CPS has spent hundreds of millions on building annexes and new schools. A significant portion of that capital spending went to predominantly white communities, including ones where the neighborhood schools are not overcrowded or where nearby schools are under-enrolled, according to an analysis by WBEZ. For example, CPS last year broke ground on a $20 million annex for Skinner West Elementary in the heart of the West Loop – where the development boom and new tech jobs are locating – to add another 500 seat capacity to the school. Yet just under a mile to the west, William H. Brown Elementary has room for an additional 500 students, according to CPS facility data. Otis Elementary, just three blocks north of the Skinner West attendance boundary, also has room for another 300 students. Chicago is being remade for the benefit of corporations and high-income new residents in many ways. Years before the explosion of private investment and building in the West Loop, the City had spent millions handing public tax money through TIFs to wealthy developers in the area. More than 60 percent of all TIF dollars spent between 2011 and 2017 went to the larger downtown area, including the Loop, Near West Side, Near South Side, Near North Side. Much of the current development boom in the West Loop resides inside the Kinzie Industrial Corridor TIF. That TIF is now generating more than $32 million per year in TIF funds, an increase of 75 percent in just three years. City Hall may not be running the development boom in Chicago, but their choice of public policies help carve its segregated path. Whether Amazon arrives in Chicago or not, we need to put an end to the everyday policies and corporate subsidies that re-enforce that path.